“When you intervene early in a child’s life, you can make a big difference. We hope this translates to a higher quality of life for people with autism spectrum disorder,” said lead author, Annette Estes, of the new study, and director of the University of Washington Autism Center. The study is about Early Start Denver Model (ESDM), a therapy that was designed to improve social and communication skills, in addition to learning skills for toddlers with autism. This model of therapy is delivered at home by specialized therapists as well as by parents. Parents are trained to give their own kids therapy and coach them. The base of the therapy is to provide a one-on-one intervention to toddlers during play time and daily routines. The therapy boosts the child’s motivation and builds on her interests and strengths while doing fun activities, like playing with toys and singing. In comparison to other community early intervention programs (speech therapy and preschool programs for kids with autism) the difference in results were significant. The fascinating result of the study shows that the improvement has a long-lasting impact for years after the therapy has originally started. Early intervention is one of the topics I’ve repeatedly emphasized, given its importance. Why? Early intervention doesn’t cure autism. 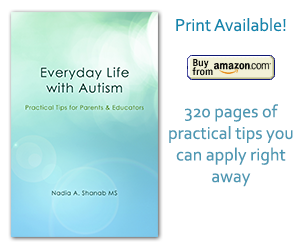 Early intervention gives the child with autism chances to develop in a different way. It improves the child’s learning skills as well as her behavior. Early intervention allows the child higher potential to achieve academically and socially. She might even be able to live independently as an adult. If your toddler/child is showing some signs of autism don’t wait, consult with a professional health provider, start with your pediatrician. Source: Early intervention improves long-term outcomes for children with autism.